Nickel alloy, including Hastelloy, Inconel and Monel possess excellent corrosion resistant properties. They are chosen for their superior performance at elevated temperatures. The presence of exogenous surface contaminants may adversely affect the engineered corrosion-resistant properties of Nickel alloys. Surface contaminants, including grease, dirt, iron, and other metallic particles are inherent to the metal fabrication process. During the passivation of Nickel alloys, the material is submerged within an acid bath. The chemical passivation treatment removes free iron and other foreign contaminants, allowing the alloy to perform and resist corrosion as it is engineered to do. 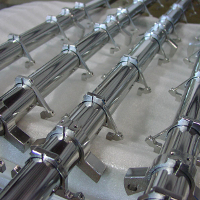 Harrison Electropolishing has performed passivation treatments on Nickel alloys with excellent results for a number of years. We have the capacity to passivate Nickel alloy components of all sizes. Harrison Electropolishing will perform chemical passivation treatments in compliance with ASTM specifications or your industry or company specific chemical passivation standard.